In the current worldwide ICT scenario a constantly growing number of more and more powerful devices (smartphones, sensors, household appliances, etc.) join the Internet, significantly impacting on the global traffic volume (data sharing, voice, multimedia, etc.) and foreshadowing a world of (more or less) smart devices, or things in the Internet of things (IoT) perspective. Among such devices we can also include wireless sensor and actuator networks (hereinafter just referred to as Sensor Networks or Wireless Sensor Networks, SNs/WSNs). According to a recent Gartner report there will be 30 billion devices connected by 2020. In this way, we can assume the next ICT scenario as a plethora, an ecosystem, a constellation of generic devices and SNs that are interconnected on the Internet. This sensible and hopefully achievable scenario has been envisaged, from many different perspectives, along several research trends (Future Internet, Internet of Things), on which institutions and governments are spending huge efforts, having already identified such topics as strategic ones. This is also in line with the technological trend, i.e. identifying personal and mobile Clouds as the hottest Cloud topics of 2012 (http://www.datamation.com/Cloud-computing/7-hot- Cloud-computing-trends-for-2012-1.html). A very high-level view of the reference scenario consists of an ecosystem of sensing and actuation devices, mobile or otherwise, that can also belong to an already existing administrative domain, as in a WSN, and therefore managed according to the policies under adoption, applied and enforced by the local node management system. Therefore our vision aims at a sensing Cloud, where sensors and actuators are provided as guaranteed, or at least tiered, services, and have to be enrolled among devices and sensor networks, or other platforms. From a low-level perspective the resources that can be involved and enrolled into a Sensing Cloud are sensors and actuators that are to be provided from varied and heterogeneous devices and infrastructure. This encompasses a big class of nodes, ranging from smartphones to RFIDs, from standalone embedded devices to wireless sensor networks. All of Advanticsys products share the same communication platform. The wireless nodes are all IEEE 802.15.4 compatible, operating in the 2.4GHz band. This ensures that in a single deployment all of the different devices, no matter the magnitude that is being measured, can communicate with each other, effectively forming cooperating networks of smart objects, where the only difference is the magnitude that is being measured. 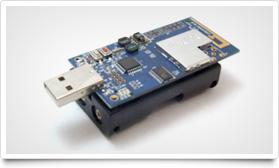 The platform is based on the TelosB / Tmote Sky open hardware design, which makes it compatible with a wide range of embedded operating systems, the most known of which are probably TinyOS® and ContikiOS®. The IEEE 802.15.4 standard only limits the lower layers of the implemented protocol, and the use of an embedded operating system allows the researcher or integrator to build upon them to find the best solution for his or her application. Additionally, it also ensures a wide community to support your development, which reduces considerably the development process. At the heart of Advanticsys wireless nodes, or motes, is the Texas Instruments® MSP430® family of microcontrollers. This family of microcontrollers uses ultra-low power RISC mixed-signal microprocessors, and is especially adequate for a wide range of low power and portable applications. IEEE 802.15.4 compatibility is granted by the CC2420® RF transceiver, designed for low-power and low-voltage wireless applications. The CC2420 includes a digital direct sequence spread spectrum baseband modem providing a spreading gain of 9 dB and an effective data rate of 250 kbps. I am Johanna Sophia, I am interested in writing about science, technology & Web related stuff. Follow me on Twitter and on Google+ Johanna.